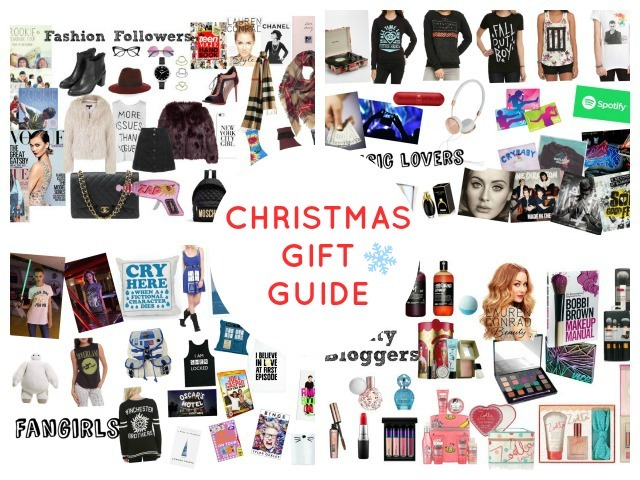 It's a blogpost or YouTube video you must see everywhere but I've done a gift guide! Actually, I did four gift guides for four different kinds of people you might know. Whether it's a sibling, parent, friend or cousin, these four gift idea sets will hopefully give you some inspiration for presents to give if you need it. Enjoy! For that loved one of yours who'd die to go to London Fashion Week or aspire to be a designer or stylist, this is the gift guide for them! The safest thing to go with is clothing! You could try a top or a button down skirt or a fur jacket, but it could be hard to get the size right. 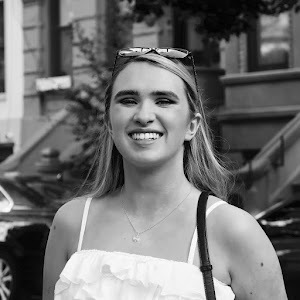 Accessories might do the trick; you can go as simple and low-budgeted as cute socks or phone cases, or go big with a present oh-so-special like a Chanel bag or fancy sunglasses (depending on how close you are with them, and how much you're willing to pay). There's also watches, jewellery, shoes, hats, scarves and other cool bags like the popular Fjallraven Kanken backpack. A magazine subscription would be brilliant. From Vogue to something more local like Stellar, a fashion lover would adore monthly style inspiration. The unique Rookie Yearbooks would do nicely too, or top fashion books from Lauren Conrad, Alexa Chung or Teen Vogue. You seriously cannot count on two hands how many concerts this person has been to, this year alone, and you can't walk into a shop with them because they'll start screaming if 'their favourite song' is playing (which is every single song to ever exist). For this muso, for Christmas you'd, obviously, get them something music related, right? Band merch. Band merch, artist merch, band merch. Hot Topic has the best unofficial merch for lots of bands and artists like Fall Out Boy and All Time Low (and they're wearable). Official merchandise is another option. Fans would do anything to show their support to their heroes, and wearing merch is the dream for all of them. Simply, you could get them that album they need. Whether it's a pre-order or instant purchase, nothing could go wrong there. Or, if they're more of the download kind, an iTunes or Spotify voucher, or even a Spotify membership would be the cherry on top. 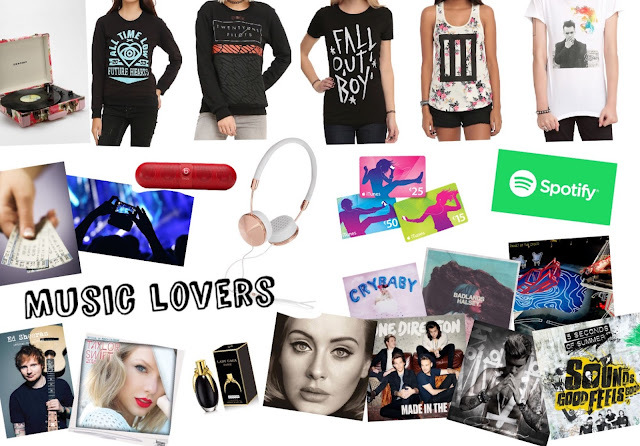 If they're a tech freak, swanky new headphones or a speaker should do. Maybe they're pretty old school -a record player would be perfect, along with a squeaky new vinyl. Sometimes, experiences are the best thing to buy rather than physical objects. Gift them this Christmas with a concert ticket! Make sure it's an artist or band you both love; it should be the best night ever. If you think they almost have everything music related, you could try something different - a perfume or calendar linked to their loves or something personally made would be super cute. *When I say beauty bloggers, I really mean anyone who likes beauty in general. I needed 'blogger' at the end to satisfy my love for alliteration. If your friend or relative is a beauty blogger, then that's even better! For the one who has an extensive collection of makeup, perfumes, nail polishes, anything of that nature, this gift guide will hopefully help you decide what to get them! YouTubers and bloggers are getting big. There's no doubt this person knows a face or two, so getting them YouTuber's beauty products would be lovely. Tanya Burr or Zoella's ranges have ideal gift sets and products now for Christmas time. I fancy that Tanya Burr Essentials palette myself, I must say. Maybe they're just getting into make up; Lauren Conrad's Beauty book is a must-have, while there are lots of other brilliant manuals out there. An Urban Decay palette or Benefit make up gift box would set them on the right track. Perhaps they're rooting for that one item that's missing from their collections; individual gems like a perfume, Mac lipstick or lipgloss, mascara or nail polish (whatever's suited to your budget again) would cross something off their Christmas wish lists, surely. Another amazing gift for people if they're make up mad would be Real Techniques brushes. Lush has the best Christmas gifts ever, so a bath bomb or two or a full gift set of gorgeous smelling goodies would be the absolute dream for pamper enthusiasts. Equally, Soap & Glory have tons of potential presents. They only cry when a fictional character dies, or their Tumblr blog or entire room is dedicated to a fandom. That's right, you're friend is a fangirl/boy! 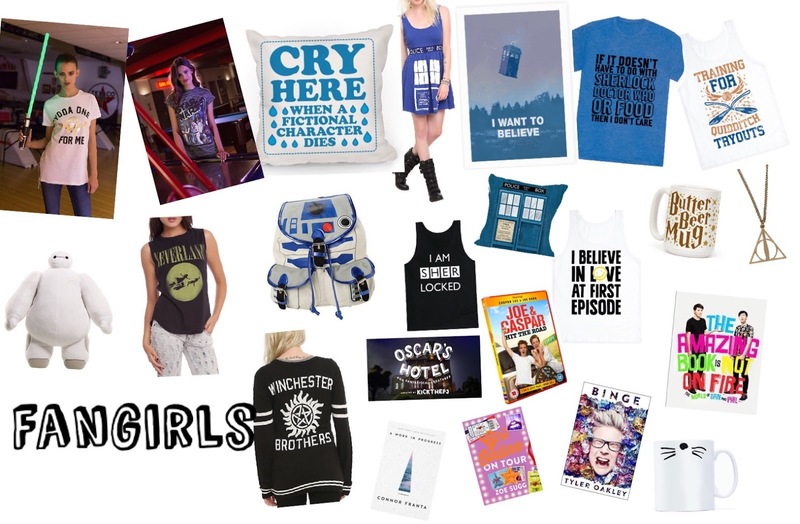 Merchandise once again would be an easy thing to buy for TV show addicts. Get them a poster, t-shirt, bag or pillow linked to Sherlock, Doctor Who, Supernatural, or whatever they fancy from Look Human, Hot Topic, Amazon or Etsy. My favourite here is the 'Cry Here When A Fictional Character Dies' pillow from Look Human - that'd come in very handy for me. Are they super super super excited for Star Wars: The Force Awakens next week? Celebrate with them by gifting them with cool Star Wars gear from Penney's. I have the pyjamas, and they're the bomb.com. Or, maybe they will never let go of Harry Potter (I mean, who would let go if it? ); a butter beer mug or Deathly Hallows necklace might not be the same as an entry letter to Hogwarts, but it will do. Perhaps they love all things Disney - take a visit to the local Disney store for a cute teddy. Hot Topic's website has some pretty magic Disney merchandise there too. Are they avid watchers of YouTubers? With YouTubers having come out with dozens of books and products, there's sure to be something suitable for this friend or relative. From Dan and Phil's new book and phan-tastic merch website, to Zoella's fiction series, any YouTuber fangirl would be over the moon with something linked to their fave(s). If they like KickThePJ, or YouTubers in general, they might love his TV show Oscar's Hotel. With a YouTuber cast (Jack Howard, Dan and Phil, Chris Kendall, Mamrie Hart, Grace Helbig and Hannah Hart... to name a few), it is a great, unique gift that can give them something to do in the evenings other than reading fan fiction. So that's it for the Christmas guides! I hope they were helpful or at least somewhat entertaining. But by the way, this isn't just a gift guide, it's also my wish list. I'm a fashion follower, music lover, beauty blogger (literally) and fangirl myself, so if you don't know what to buy for me this Christmas, look above. I'm expecting something from you now. It better be good.